Here is a collection of easy stories that you can use to teach pronouns, possessive form, present progressive, present and past tense verbs, spatial concepts, and other structures in short stories with cute illustrations that show the story action. Each story is designed to target specific grammatical structures or concepts. The activities also help students sequence information and use vocabulary effectively in sentence contexts. The reproducible picture stories can be taken home for additional practice. The questions that follow each story are designed to stimulate the production of sentences containing the target structures. Easy Stories with Four Pictures. 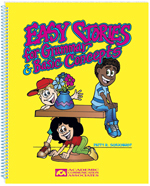 Each story in this section can be used to target a group of common grammatical structures and basic concepts. Spatial concepts such as on, in, under, and behind are emphasized in simple sentences containing present tense verbs. The questions that follow each story can be used to elicit personal pronouns, the present progressive, spatial concepts, and other basic structures. Easy Stories with Two Pictures. Each story in this section focuses on a specific concept contrast (e.g., over/under). The stories can be incorporated into classroom lessons in which specific concepts are emphasized. Picture Story Starters. Each picture is designed to elicit a specific concept. A story starter that contains the target concept is used with each picture. After listening to each story starter, the child finishes the story.